c1900: This view looks almost the full length of Sun Dial Terrace in Main Street. The sundial can just be seen under the eaves of the second cottage. The style of the carved lettering on the sundial suggests that it dates from the late 17th century or early 18th century. It was once mounted on a row of cottages known as Sundial Terrace. 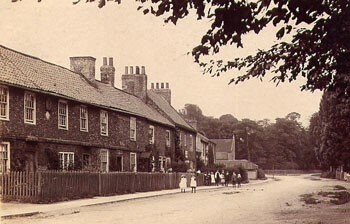 In 1908, the two cottages at the end of the terrace were bought by the York Equitable Industrial Society (as the Co-op was then known). They were later demolished when the Co-operative shop was built probably during the 1930s; and the dial was saved for the new building. The restored sundial in Harriet James’s workshop. The Latin motto translates as ‘Time slips away’. The restored sundial has been re-mounted on the Co-op wall at an angle to the façade of the building. This is because the dial is designed to face due south but the building faces 15° to the east of south. The two end cottages of Sundial Terrace probably faced even further to the east of south and so the sundial would never have read the correct time when it was on the wall. This suggests that the sundial was originally made for a building elsewhere. The angles of the hour lines on a sundial also have to be correctly calculated for its particular latitude. Moving a sundial from one latitude to another will affect the accuracy of its time-keeping. An analysis of the angles of the hour lines reveals that its maker accurately laid out the lines for the latitude of 54° North (+ or – 0.6°) which closely matches the latitude of Bishopthorpe, which is 53.9° North. This means that the sundial was designed for a building in or near Bishopthorpe. To tell the time, look at the shadow cast by the projecting arm or gnomon of the sundial. When the upper edge of the shadow lies along one of the longest black hour lines, it is the hour, local solar time. Intermediate quarter-hours can be read from the short lines within the oval border. 1) Clocks are set to the time at the Greenwich Meridian. As Bishopthorpe is 71.8km (44½ miles) or 1° 5′ 45″ west of the Greenwich Meridian, the sun passes overhead here 4 minutes and 23 seconds later than it does at Greenwich. This makes the sundial slow compared to the clock. 2) Sundials can be fast or slow to the clock depending on the time of year. The difference between sundial time and clock time is known as the Equation Time. It happens because the earth orbits the sun in an ellipse and is tilted on its axis so it is not always at the same distance from, or at the same angle to the sun. 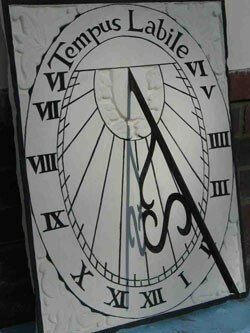 3) The sundial will be an hour slow in the summer when clocks go forward an hour for British Summer Time. With thanks to Harriet James for the above information.